Tibet is a series of stories stitched together by moments that are so ethereal that they feel like epiphanies. That’s how I picture things, when I close my eyes, as a kaleidoscope of revelations and sights gleaned from a dozen journeys in Tibet over the span of a decade. I close my eyes now, as I write this, and find myself on the grasslands among the nomads one golden sunset at the height of summer. I see the women rounding the calves for the night and hear them chanting Buddhist mantras and sutras in high-pitched desirous voices that carry far in the emptiness of the grasslands; I see the young men racing the horses across the encampment in prankish bravado; and, on the ridges, the silhouettes of herders and yaks approaching camp; and I remember gazing with grateful wonderment at the grasslands at 4,000 metres, undulating timelessly towards every horizon, the flat folds punctuated only by the summit of the holy mountain, a cone of granite and ice. I close my eyes again and find myself, on another occasion, in the courtyard in front of a significant temple among two dozen monks ceremoniously banishing Mara (symbol of mental impurities); there were no other spectators except us; and earlier I had stood alongside the dead lama that had been preserved in an opulent golden stupa: his body had been sealed with gold paint after dying, and he had been propped in a sitting position in the stupa, an eternal figure staring out over his flock even after death. When I close my eyes the third time I see, at another temple, the vultures gliding overhead and the dead man’s body being chopped with an axe as the man hitting out with the axes grimly recite the mantras, and then the vulture circling down to the body, tearing bits of flesh and eating voraciously. And if I close my eyes once more I am transported to the high grassland again: I walk out of the tent of the clan leader one evening, it’s pitch dark and the wind is howling, and the Tibetan mastiffs are barking and yanking at their chains, and in that menacing scene the sky is vivaciously alive – the sky laden with bright stars, with shooting stars whoosing through the air overhead. 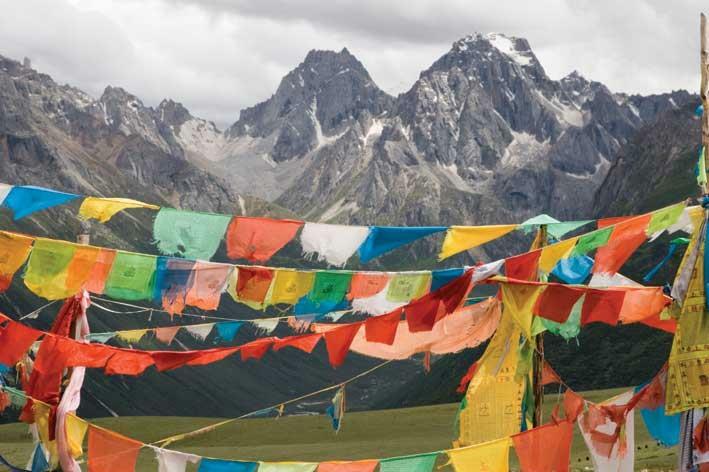 But the romance of travel in Tibet – the sense of freedom and connection with nature among the endless grasslands, among the mountains that can be broody or spectacular, the lakes that can be morose or luxurious – the romance is tempered with the hardship and treacherousness. To start with, the environment in Tibet is incredibly harsh: striking sun, fierce squalls, dry oxygen-starved air – high-altitude headaches are common, the skin becomes wrinkly, you feel worn down constantly. In summers it’s cold at night, hot during the day (in winter, blockages of roads with snow can maroon you for weeks on end, few people consequently travel in winter in Tibet). It’s these juxtapositions of sharp contrasts that have made all my Tibetan travels a series of revelations. 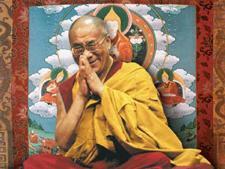 In the popular imagination the mere mention of Tibet evokes enigma, remoteness, outlandishness. The Tibetan plateau is one of the tracts of vast wilderness left on earth; it is larger in landmass that Europe and it only has a few million inhabitants. I have been on road-trips in Tibet in which I only saw a handful of other cars in drives of six hours or more. It’s an incredibly empty and rugged place. Tibet is also one of the most inaccessible places on earth partly because of geography (much of the plateau is snowed-in over the long winters, distances are huge and places of interest far between) and partly because of bureaucratic restrictions: untrammelled travel in Tibet for non-Chinese is not possible. The Chinese government stipulates that foreigners travel on package tours; and package tours only mostly take in well-beaten routes that are mostly clustered around Lhasa, the capital. I averted these restrictions by skirting around Tibet as a political entity: the borders of Tibet as a province of China are much smaller than the true spread of the Tibetan plateau. I never went to Lhasa, never set foot in Tibet province, but I travelled all around Tibet in the borderlands. In Tibetan history, some of those so-called hinterlands (in Tibet everywhere is hinterland) were centres of power and trade and cultural expression. Some of the largest and most eminent Tibetan monasteries are outside the province of Tibet; ditto with mountains ranges and lakes and grasslands – there is a larger density of nomads on the eastern fringes of Tibet, in the old Kingdom of Kham, than anywhere else in Tibet province. It is still not easy to travel in these regions, despite the chance to travel unrestrictedly (the relatively easiest place to get to is Ladakh in northwest India), because of the remoteness and scant infrastructure and absence of travel intelligence. Me, I have been lucky that, in the course of my work as a writer and photographer for geographical magazines, I travelled with fellow explorers and photographers from China. They had the contacts and the info, I was just a companion. And in this way, every trip to the Tibetan hinterlands and heartlands (another contradiction in terms, that’s Tibet for you), every trip was a story, and the experiences and revelations I accumulated on every trip would never be had again. Every trip was inimitable.